By relying on the only thing that can defeat fear – courage. The Cowardly Lion didn’t have it and it would seem Joshua didn’t either. 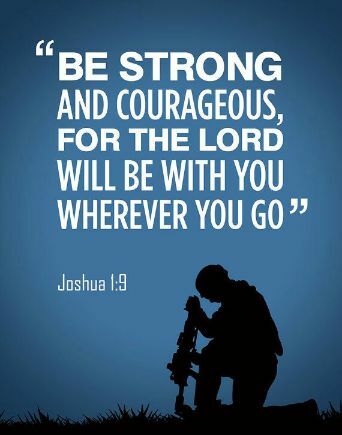 Three times in Joshua chapter 1 God told him “…be strong and of good courage.” It must have been obvious that Joshua was lacking in fortitude. It’s one thing to say, “Have courage.” It’s quite another to act on it. Fear is so overwhelming it can easily swallow up any bravery we might muster. But we must have it. Courage is the “It Factor” that moves us forward in life. If we allow our fears to overwhelm us we will remain stuck in place, never realizing the hopes, dreams and rewards of what’s out there. Note the absolutes here – “every” (place), “will” (tread), “no” (man), and “shall” (divide). God couldn’t have been more forthright about what was to come. Joshua would have success. And yet there’s still fear. Which tells me fear is a natural emotion that can arise to any circumstance of life, whether or not we know the future outcome. Courage therefore must be ever present to knock fear down. If the abiding presence of God is good enough for Joshua then it’s good enough for me. Questions: How do you summon the courage to face the daily trials of life? Have you ever taken over for another leader? What fears did you face? Do you even have fear when you are pretty sure what the outcome of a situation will be? What’s the thing you are afraid of most? We can do all things and have courage to face it all if we believe in God. Need a love button. Loved this. I think that picturing yourself having reached your goal is often a good way to gather up the courage to go for it. That’s always been a solid way to go about things for me. I agree visualization really does help. Many athletes use it to picture themselves doing some action that leads to them winning. When I pray, I can feel the courage and strength growing inside of me. You’d think that would encourage me to pray more in times of difficulty, but usually I am so distracted by the difficult thing that I forget. It’s bizarre how that happens! I can totally relate to what you are saying Kirsten.